15 amazing songs powerfully teaching young and old alike of the matchless wonder of God and of his mighty, saving works. Get on board the GOD ROCK! Bursting with 15 amazing new songs, including "God Never Says Oops! ", "Survival Man", "God United" and "Super Chef", GOD ROCK is sure to become an instant classic, powerfully teaching young and old alike of the matchless wonder of God and of his mighty, saving works. The Enhanced God Rock CD includes full sheet music, singalong backing tracks and playful colouring-in pages, hand-drawn by Colin! One of my favourite Colin CDs! There is an incredible musical range (so something there for everyone) with an astute observation of society and people (survival man, TV chefs, bikers, etc.) and some catchy tunes. Our boys (3.5 and 1.5) put it on very loud and run round shouting "God rock!" They love it, although it is aimed at older children. We thank God for Colin! Really easy to sing along to. Great lyrics. Brilliant CD for the car. I have a 4 year old and two year old and they both sing along on the school run. It also promotes lots of questions about Jesus, which is always good! I think I still slightly prefer 10, 9, 8 with the readings from the Bible in between songs, but this is still excellent. A great CD for the whole family to sing along to in the car! This was the first Colin CD I had bought and we are enjoying the varied and catchy tunes and memorable words which keep biblical truth in our heads! My one-year-old is engaged when we sing along, he will grow into it but meanwhile it's still good listening for us parents! Our children (2 and 4) absolutely love this CD, they ask for it as soon as we get into the car. It's very easy listening and they have memorised several Bible verses and truths about God. (I even find myself singing the songs sometimes too!) Thanks Colin, you are very talented and God is using your skills. 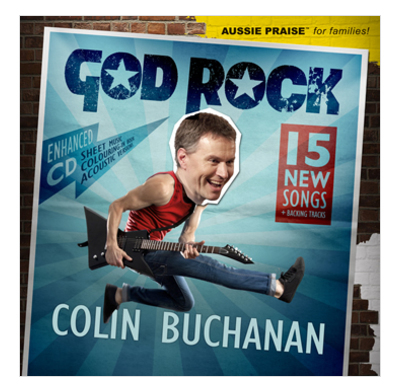 We think 'God Rock' is the best Colin album. My wife and I enjoy listening to this one most. Our kids (4 and 3) have their favourite Colin songs on it. (Although, musically it is aimed at older children). We love the two songs about God's Sovereignty (God sits in the highest place / God never says 'Oops') and the two songs about the Trinity (Rev Master-T's Trinity Mashmix / God United). Colossians 3:16 in action. We are loving this CD. My 3yr old regularly requests it and is learning the words. It is a great mix of fun and funky songs reinforcing the intervening passages of scripture which are answering children's questions about God. My 1yr old shouts 'Prove it!' when Colin is asked for a scripture to back up what he is saying about God. Its good to know they are enjoying themselves and learning comforting truths about God that will stand them in good stead for life. Lovely to sing along to bible verses with the children, catch tunes so you find yourself singing the verses most of the day which is up lifting. Some of the tracks I don't like as you cant hear the words very well but most of them are great and there are a lot! !